happiness in your life always......"
Rice payasam is one among my favourite & quickly becomes ur favourite too.... It's rice pudding typically made by boiling rice with milk and sugar. It is often flavored with cardamoms, saffron, pistachios or almonds. It’s a delightful dessert for anytime of the year and is served in almost many of Indian festivals & celebrations. While the dish is traditionally made with rice, it can also be made with other ingredients such as vermicelli (sayviah) which is a thin noodle. Wash & soak the rice for 1/2 hr in water. Boil the milk, in a heavy bootom pot. When the milk comes to a boil, add the rice & sugar and simmer. Stir to insure that the milk does not stick to the bottom. Cook till the rice is cooked and the milk thickens and reduces to half its original volume. Heat ghee on a low flame & add cashews, raisins and pistachios. 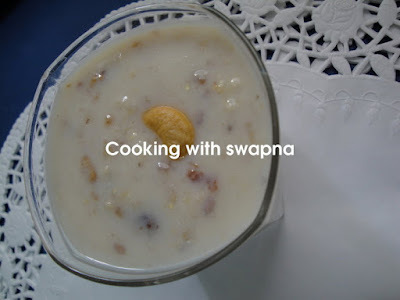 Add the roasted nuts, cardomom powder, condensed milk in the payasam & mix well. Garnish it with a pinch of saffron & rose petals. Lovely Payasam . Good post for this season.